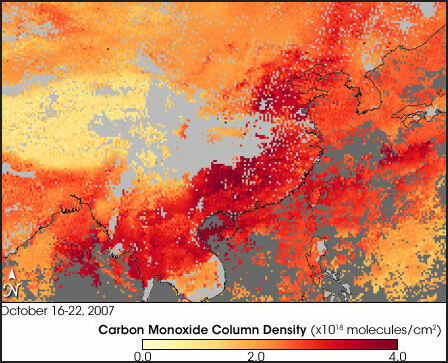 China has been the world's largest largest emitter of carbon dioxide since about 2006 , when it passed the United States. It was not supposed to overtake the United States as the world’s leading producer of greenhouse gases until 2020 but a study by a Dutch government-funded group released in June 2007 determined that China was already the world’s No. 1 emitter of carbon dioxide then. It surpassed the United States in 2006 when it produced 7.5 percent more of these gasses than the United States compared to 2 percent less in 2005. In August 2008, Germany’s IWR Institute concluded that China’s carbon dioxide emissions in 2008 were 6.8 million tons---the most of any nation and 178 percent higher than the 1990 level. The United States and China together account for 40 percent of the world's greenhouse gases --- most of which is derived from coal. China produces about 23 percent of the world’s carbon dioxide, compared to 21 percent from the United States. China produced 6.23 billion metric tons of carbon dioxide in 2006, compared to 5.8 billion metric tons of the United States. The increase was attributed mostly to increased coal consumption and cement production. Greenhouse gas emissions in China are growing very rapidly. 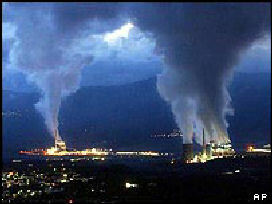 Emissions increased by 56 percent between 1992 and 2002, when it released 3.3 billion tons of carbon dioxide. Since 2002 emissions have almost doubled again. In 2004, China produced 4.7 billion metric tons of carbon dioxide emissions for 17.4 percent of the world output, compared to 5.9 billion metric tons of carbon dioxide emissions for 21.9 percent of the world output for the United States, 1.7 billion metric tons of carbon dioxide emissions for 6.2 percent of the world output for Russia and 1.3 billion metric tons of carbon dioxide emissions for 4.7 percent of the world output for Japan. By 2025 the emission levels in China are expected to double or triple, equaling increase in the entire industrialized world. Already emission increases in China cancelled the progress made in other countries by reducing emissions in accordance with the Kyoto protocol. Greenhouse gas emissions are increasing, due mainly to increase in coal use to fuel China’s industrial and economic boom. New power plants are being built, more coal is being burned, sales of cars, refrigerators and air conditioners are soaring. All of these things produce more carbon dioxide and other gases. According to a 2007 survey by the Center of Global Development the China power sector alone releases 2.68 billion tons of carbon dioxide, compared to 2.79 billion released by the United States and 400 million tons in Japan. China has not signed the Kyoto Protocol and is exempt anyway because it is considered a developing country. Using the same logic as the United States, it worries that if it did sign economic growth would be compromised. China emits higher levels of greenhouse gases than other developing countries. What really scares people the most is what will happen if per capita carbon dioxide usage rates in China rise to levels near those of the United States and other developed countries. On a per capita basis China produces 4,763 kilograms of carbon dioxide per person, compared to 19,278 kilograms for the United States. A 2007 report by the Intergovernmental Panel on Climate Change predicts that China will suffer worse consequence from global warming than other parts of world. By some estimates the northern part of the country might experience temperature increased of 5 and 6 degrees C, patterns of rainfall might radically shift, and glaciers in the Himalayas and Tibetan plateau might melt, depriving much the country of water for irrigation and other uses. By some estimates global warming could cost China $39 billion a year, or 5 percent of GDP, within a few decades and cut China’s grain production by a third in the second half of the 21st century. Global warming is expected to produce droughts and erratic precipitation and exacerbate land degradation in arid areas, making it particularly for subsistence farmers there. Temperature increases of 2̊ to 3̊C by the end of the 21st century are expected affect rainfall, increase desertifcation, intensify typhoons, dry up already scarce water supplies, deplete forests, cause flooding along the coasts, expand the ranges of diseases like malaria and exacerbate the bird flu problem. Migratory birds that would normally fly through China or linger for short period might stay longer, increasing the chance of the disease spreading. Piao Shilong of the Center of Climate Research at Peking University wrote in a study published in Nature in August 2010: “Climate change may induce a net yield reduction of 13 percent by 2050. Such pronounced summer warming would inevitably enhance evapo-transpiration, increasing the risk of water shortage for agriculture.” In his study, without taking into consideration technological advancements. he estimated that rice yield could decline by 4 to 14 percent, wheat yields could drop by 2 to 20 percent and corns yields could decline between zero and 23 percent. Hong Kong, Shanghai, Tianjin and the Pearl, Yellow and Yangtze River Deltas are particularly vulnerable to sea level rises associated with global warming. If there is a one meter rise in the sea level brought about global warming it is estimated an area the size of Portugal will be inundated with water, including important manufacturing centers around Shanghai and Guangzhou and 67 million people will have to leave their homes and land. Some predict that global warming will increase rainfall amounts in northern China but increased heat evaporation will negate many of the benefits. Other areas are expected to become drier and more prone to drought. Storms, floods, heat and drought, which currently kill more than 2,000 people in China, are expected to worsen as a result of more extreme weather caused by global warming. A report issued in November 2010 by the environmental group WWF predicted extreme weather, storms, floods and droughts on the Yangtze basin---where 400 million people live---over the next few decades as a result of global warming. In the past decade, according to the survey, temperatures in the region have risen by 1 degree C, causing increases in flooding, heat waves and drought. Other surveys indicated that heat waves have become more common and the number of cold days has fallen as a result of global warming. In Inner Mongolia, global warming appears to have made the region drier. The areas of China that are expected to be affected the most by global warming in the future are northeast, which is expected to warm at a rate of 0.36 degrees a decade, and Inner Mongolia, which is expected to warm at a rate of 0.4 degrees a decade. Coal, a major source of CO2 The average temperature in China in 2007 was the highest it had been since 1951, according the Chinese meteorological officials. It was also the 11th straight year that China recorded abnormally high temperatures. The average temperature from January to November in 2007 was 11.3̊C, 1.2 C higher than average years. Already significant changes attributed to global warming have occurred. Sea levels in China in 2003 were 600 millimeters above worldwide levels between 1975 to 1986 Chinese reported. Sea levels off of Shanghai, Tianjin and other cities are rising at alarming rates, contributing to the contamination of drinking water supplies. 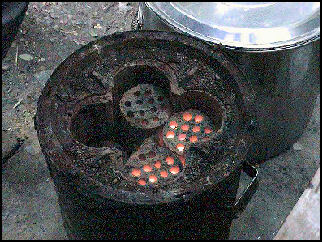 The problem is aggravated by excessive taking of ground water which is causing ground levels to drop. According to the Chinese State Oceanic Administration sea levels rose by 115 millimeters in Shanghai and 196 millimeters in Tianjin between 1978 and 2008 and are expected to rise an average of 3.2 millimeters a year in the coming decade. Temperatures on the Tibetan plateau have risen 1̊C in the past 30 years and glaciers and snow cover there are shrinking 10 times faster than during the previous 100 years. Global warming has also been blamed for unusually warm winters, droughts in Sichuan and low levels of the Yangtze. Some have blamed global warming for the mild winters that have caused havoc and melting ice sculptures at the annual winter ice festival in Harbin. Temperatures reached 61 degrees F in early February 2007. Global Warming, a Good Thing for China? In the 13th century before the raids by Genghis Khan, Xie said, “With the cold temperatures there was drought in Mongolia. Since people were eating livestock which fed on the grasslands, they needed to go south. When there was warmer weather and more rain, the Mongols didn’t attack.” A similar cold spell occurred during the downfall of the Zhou Dynasty in 771 B.C. while warm spells were occurring when the Shang Dynasty was at its height in the 2nd millennium B.C. and in recent years when the Chinese economy has boomed. CO2 emissions in 2012 jumped by record amounts both worldwide and in China. China now has a 363 new coal plants on the drawing boards. And behind China comes rising India, with 455 new coal plants on the drawing boards. Industry, a major source of CO2 China is becoming more concerned about global warming. It has been fairly active in international discussions on reducing carbon dioxide emissions and seems willing to do its part to address the problem as long as it doesn’t endanger economic growth. In 2007, a Chinese report was issued that addressed ways that greenhouse gases can be reduced, the consequences of global warming and how these consequences can be dealt with. 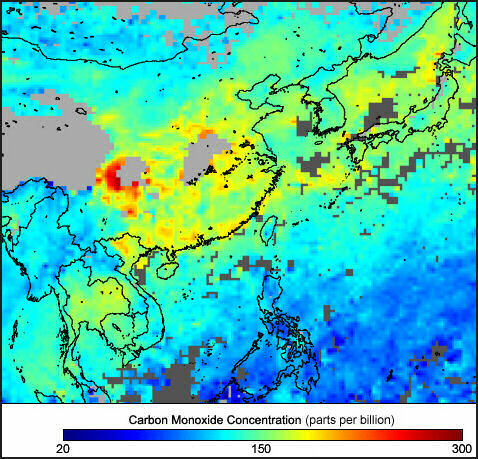 China’s carbon dioxide production not only affects China it affect the entire world. China has promised to share in the burden of cutting carbon dioxide and participating in post-Kyoto talks. But at a United Nations meeting on global warning in May 2007 China and the United States were criticized for trying to water down a report on the potentially catastrophic affects of global warming and pushing to raise the lowest target level of carbon dioxide. The question is no longer whether China is equipped to play a role in combatting climate change but how that role will affect other countries. The International Energy Agency noted that Europe's plan to extend 1990-2020 carbon dioxide cuts from 20 percent to 30 percent would equal only two weeks of China's emissions. If China’s emissions keep climbing as they have for the past thirty years, the country will emit more of those gases in the next thirty years than the United States has in its entire history. Getting China and India to reduce or slow their carbon dioxide emissions is vital if progress is going to be made fighting global warming but asking these countries to slow their development or pay for expensive new technology is morally hard to defend when one considers that Western countries largely created the global warming problem and asking China and India to sacrifice their development to fix it is not really fair. At the United Nations Climate Change Conference in Bali in December 2007, China insisted it would not agree to mandatory emission cuts, saying the United States and other industrialized countries should take the lead. A Chinese official at the conference said, “China is in the process of industrializing and there is a need for economic growth to meet the basic needs of people and fight poverty...I think there is much room for the United States to think whether it’s possible to change [its] lifestyle and consumption patterns in order to contribute to the protection of the global climate.” Otherwise China let it be known at the conference that it was concerned about global warming and it was doing all it could to contribute, if for nothing else out of self interest. The vague agreement reached at the Copenhagen summit on global warming in December 2009 was a disappointment to many. It failed to set specific standard and legal limits and fell far short of what was expected. In it the United States and China and other emerging powers such as Brazil and South Africa set a target of limiting global warning to a maximum of two degrees C and offered funding to help poor nations adapt to climate change, but failed to specify details, numbers or anything that was legally binding. About 28 nations signed the agreement, called the Copenhagen Accord, but many hope a better agreement will be worked out in the future. Sweden called the accord a disaster, British Prime Minister Gordon Brown said the summit was “at best flawed and at worst chaotic.” Many blamed China for the shortcomings of the deal. Britain accused China of “hijacking” the talks and holding the world at ransom by blocking a more substantiative deal. China said that it viewed a binding climate pact as an obstacle to its “right to develop” and accused Britain of trying to sow discord among developing nations on the global warming issue. During the talks China sent low level officials to negotiate with U.S. President Barack Obama until the last minute when Premier Wen Jiabao finally granted him an audience. This was widely viewed in China as disrespectful and humiliating treatment of Obama. In October 2010, China hosted major conference on global warming---organized by the United Nations Framework Convention on Climate Change (UNFCCC)---in Tianjin. China’s lead negotiator at the climate change talks, Xie Zhenhua, said that China was prepared to enter into a legally binding agreement after current voluntary programs expire at the end of the decade, seemingly a major step. China has always contended that because of its rapid economic growth and the persistent poverty of millions of its citizens, it cannot be bound by the same emissions standards as advanced industrialized nations. Mr. Xie outlined five conditions under which China would consider joining such a treaty as a full partner, the major one being that China and other rapidly growing economies must be treated differently from the so-called rich countries. But that has been a deal-breaker for the United States for years and is the central reason that the Senate refused to even consider ratifying the Kyoto Protocol, a 1997 agreement whose goal, still unmet, is to limit global greenhouse gas emissions. The standoff has threatened to derail the process in each of the past several years, but at the end of the two-week session the parties usually pull back from the brink and announce an incremental, face-saving deal. Negotiators appear close to agreeing on how to structure a fund that is supposed to generate $100 billion a year in public and private financing for climate change programs by 2020. They have also made progress on programs to save tropical forests from clear-cutting, transfer clean-energy technology to emerging nations and refine systems for verifying that countries are taking steps to cut emissions.